SUMMARY: In this article, the underlying theory of clinical diffusion MR imaging, including diffusion tensor imaging (DTI) and fiber tractography, is reviewed. First, a brief explanation of the basic physics of diffusion-weighted imaging (DWI) and apparent diffusion coefficient (ADC) mapping is provided. This is followed by an overview of the additional information that can be derived from the diffusion tensor, including diffusion anisotropy, color-encoded fiber orientation maps, and 3D fiber tractography. This article provides the requisite background for the second article in this 2-part review to appear next month, which covers the major technical factors that affect image quality in diffusion MR imaging, including the acquisition sequence, magnet field strength, gradient amplitude and slew rate, and multichannel radio-frequency coils and parallel imaging. The emphasis is on optimizing these factors for state-of-the-art DWI and DTI based on the best available evidence in the literature. Diffusion MR imaging of the brain was first adopted for use in clinical neuroradiology during the early 1990s and was found to have immediate utility for the evaluation of suspected acute ischemic stroke. Since that time, enormous strides forward in the technology of diffusion imaging have greatly improved image quality and enabled many new clinical applications. These include the diagnosis of intracranial pyogenic infections, masses, trauma, and vasogenic-versus-cytotoxic edema. Furthermore, the advent of diffusion tensor imaging (DTI) and fiber tractography has opened an entirely new noninvasive window on the white matter connectivity of the human brain. DTI and fiber tractography have already advanced the scientific understanding of many neurologic and psychiatric disorders and have been applied clinically for the presurgical mapping of eloquent white matter tracts before intracranial mass resections. This 2-part review explores the current state of the art for the acquisition and analysis of clinical diffusion imaging, including DTI and fiber tractography. This first article begins with an explanation of the basic physics and underlying theory of diffusion-weighted imaging (DWI) and apparent diffusion coefficient (ADC) mapping. This is followed by an overview of the additional information that can be derived from the diffusion tensor, including diffusion anisotropy, color-encoded fiber-orientation maps, and 3D fiber tractography. This article provides the necessary background for the second article, which focuses on the major technical factors that affect image quality in diffusion imaging, with an emphasis on optimizing these factors for state-of-the-art DWI and DTI based on the best available evidence in the literature. 1), where <r2> refers to the mean squared displacement of the molecules, t is the diffusion time, and D is the diffusion constant, a constant of proportionality for the particular substance being measured. In clinical diffusion imaging, the type of diffusion being investigated is water self-diffusion, meaning the thermal motion of water molecules in a medium that itself consists mostly of water.2–5 The diffusion constant, typically expressed in units of square millimeters per second, relates the average displacement of a molecule over an area to the observation time, with higher values of this constant indicating more mobile water molecules. The ADC is the diffusion constant measured in the clinical setting, reflecting the limitation that in vivo diffusion cannot be separated from other sources of water mobility, such as active transport, flow along pressure gradients, and changes in membrane permeability. Imaging molecular water diffusion confers the ability to probe the microstructural properties of biologic tissues. The typical diffusion times used for clinical DWI are 10–50 ms, corresponding to average molecular displacements on the order of 10 μm. This microscopic spatial scale is in the same range as that of cellular dimensions. This sensitivity to cellular processes has been exploited clinically for improving the detection of acute cerebral ischemia,4, 6–10 distinguishing vasogenic from cytotoxic edema,11–16 identifying foci of axonal shearing injury after acute head trauma,17–19 characterizing cellularity in brain tumors,20–27 discriminating between metastases and gliomas22, 27 and between tumor recurrence and postsurgical injury,28 differentiating pyogenic abscesses from tumors,29–31 and for the noninvasive mapping of white matter connectivity by using the diffusion tensor model,32–36 among other applications. Pulse sequence diagram for a diffusion-weighted acquisition shows that 2 diffusion-sensitizing gradients (dark gray) are added to a spin-echo sequence, 1 before and 1 after the 180° refocusing pulse. The diffusion-weighting factor b depends on the amplitude of the diffusion gradient (G), the duration of each diffusion gradient (δ), and the interval between the onset of the diffusion gradient before the refocusing pulse and that following the refocusing pulse (Δ). RF indicates radiofrequency pulses; Gz, gradient pulses. 3) where γ is a physical constant known as the gyromagnetic ratio, G is the amplitude of the diffusion gradient typically measured in milliteslas per meter, δ is the duration of each diffusion gradient in milliseconds, and Δ is the interval between the onset of the diffusion gradient before the refocusing pulse and that after the refocusing pulse, measured in milliseconds (Fig 1). The units of b are seconds per square millimeter, reciprocal to the units of ADC. It can be seen from equation 2 that raising b increases the degree of diffusion-weighting (ie, the loss of signal intensity Si along direction i produced by application of the diffusion gradients). From equation 3, it is apparent that boosting the gradient amplitude G and the gradient duration δ are the most effective ways of increasing the diffusion-weighting, due to the quadratic dependence of b on these 2 parameters. Typical values of b used in clinical applications range from 600 to 1500 seconds per square millimeter. The lowest values of b are used for imaging of fetuses in utero or premature neonates, due to the very high ADC values of these structurally immature brains.38, 39 The highest b factors have been advocated for hyperacute stroke imaging in adults at 1.5T, to maximize sensitivity to the often subtle reductions in ADC in this very early stage of cerebral ischemia,40, 41 though a recent 3T study42 found no benefit of b = 1500 s/mm2 DWI for stroke detection compared with the traditional adult b-value of 1000 s/mm2. 4) where k is a proportionality constant and T2 is the transverse relaxation time of the interrogated tissue. Hence, T2 prolongation within pathologic tissues may cause DWI signal hyperintensity, even in the absence of reduced ADC values. This T2 shinethrough effect renders DWI hyperintensity less specific for clinical diagnosis than decreases of ADC that are confirmed on an ADC map (Fig 3). 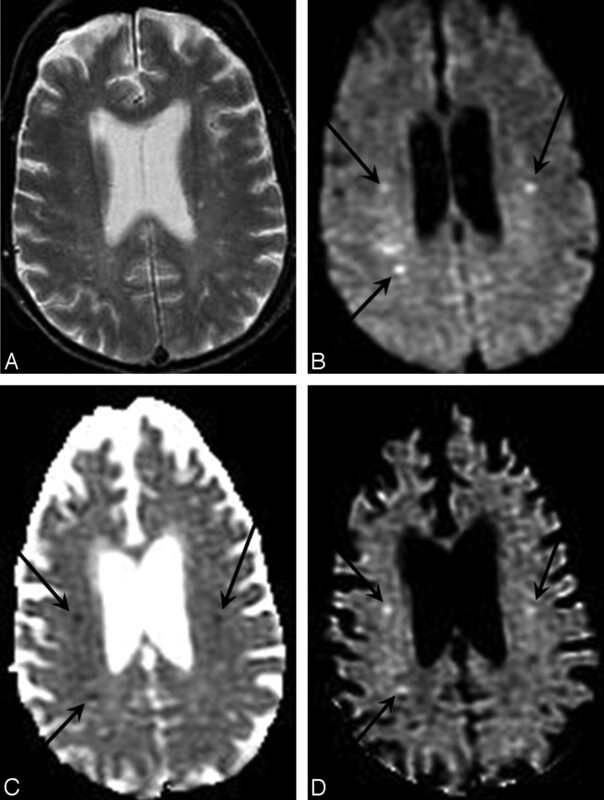 Conversely, decreases in T2 may mask a true reduction in ADC values; this phenomenon has been referred to as “T2 blackout”.43 T2 blackout may be at least in part responsible for the relatively low sensitivity of DWI signal intensity compared with ADC maps for the detection of acute hypoxic-ischemic injury in neonatal white matter because such lesions typically reduce the very long T2 relaxation times of white matter in neonates. However, T2 effects can also be beneficial: The “lightbulb” brightness of DWI signal intensity in acute infarcts of the adult brain is caused by the multiplicative effect of T2 prolongation and reduced ADC (equation 4). Therefore, DWI has better sensitivity than ADC maps for small acute ischemic lesions in children beyond infancy and in adults. 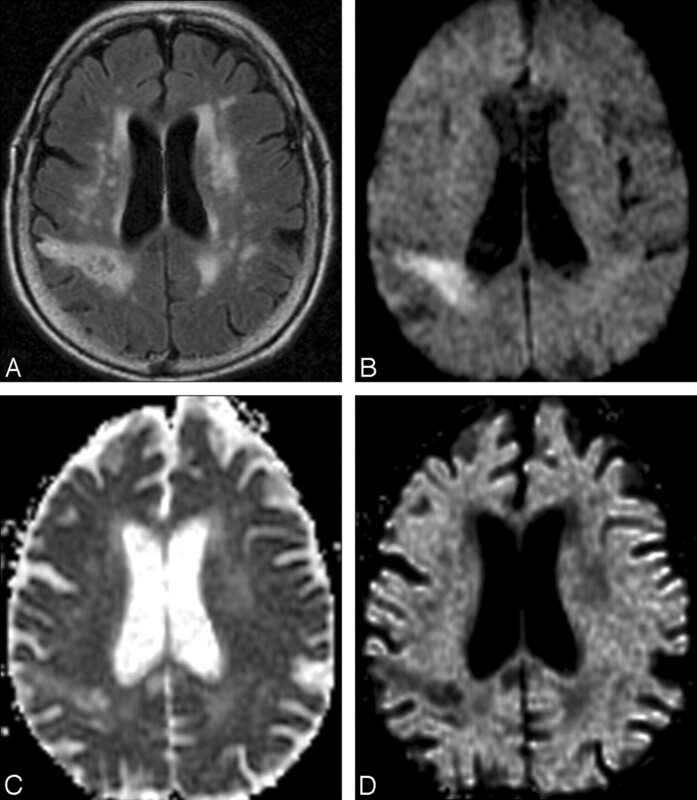 DWI enables more sensitive and specific diagnosis of acute cerebral ischemia in a case of embolic infarcts due to endocarditis. 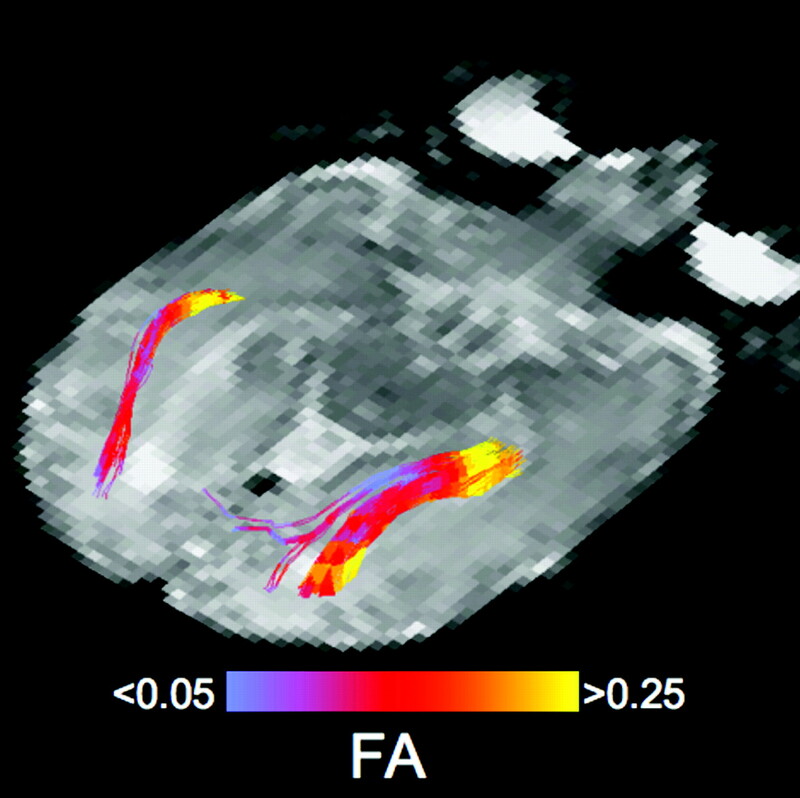 A, Conventional spin-echo T2-weighted image shows only nonspecific white matter foci of signal hyperintensity. B, Combined DWI image at the same axial level reveals 3 punctuate hyperintense white matter lesions (arrows) that are suggestive of embolic infarcts. C, Corresponding ADC map confirms that there is reduced diffusion in these lesions (arrows), consistent with acute ischemia. D, Attenuation coefficient image, also known as the exponential diffusion image, shows these lesions as remaining hyperintense (arrows). This demonstrates that the hyperintensity on the combined DWI image is not due to T2 shinethrough artifact. T2 shinethrough artifact in DWI. A, T2-weighted fluid-attenuated inversion recovery image shows numerous nonspecific periventricular and subcortical hyperintense foci, as well as a larger wedge-shaped region of hyperintensity in the right parietal lobe suggestive of infarct. B, Combined DWI image at the same axial level reveals that the right parietal abnormality is hyperintense, suggesting acute ischemia. C, Corresponding ADC map demonstrates elevated mean diffusivity within the abnormal region, consistent with chronic infarction. D, Low signal intensity within the lesion on the attenuation coefficient image confirms that the DWI signal-intensity hyperintensity is due to T2 shinethrough and does not reflect reduced diffusion as would be seen in an acute infarct. Note from the last expression, compared with equation 4, that only the diffusion-related exponential term remains, eliminating the T2-weighting effects. Like DWIs, areas of reduced diffusion appear bright on AC maps and areas of elevated diffusion appear dark. This is the opposite of the contrast polarity of ADC images. However, like ADC maps, AC maps remain less sensitive than DWI signal hyperintensity for detecting small acute infarcts because they lack the multiplicative effect of T2 prolongation combined with reduced diffusion that produces the “lightbulb” effect on DWI. In isotropic diffusion, molecular motion is equal in all directions. Pure water at body temperature demonstrates isotropic diffusion, with an ADC of approximately 3.0 × 10−3 mm2/s. In the human brain, isotropic diffusion may be found in the CSF spaces, except in areas of bulk flow such as the jets emanating from the foramina of Monro or through the cerebral aqueduct. Due to its complex microarchitecture, the gray matter of the cerebral cortex in adults is also thought to exhibit isotropic diffusion at the clinical range of b-values,33, 47 though some studies differ.48 When diffusion is isotropic, the choice of direction for the diffusion-sensitizing gradient is not important because ADCi is identical for all directions i. In anisotropic diffusion, molecular mobility is not equal for all directions. White matter tracts with tightly packed coherently oriented fiber bundles hinder water displacement perpendicular to the direction of the fibers, resulting in larger ADCi values parallel to the tracts rather than orthogonal to them.49 Hence, more than 1 diffusion-encoding direction is required to characterize regions of anisotropic diffusion. If only a single diffusion direction was probed, interpretation of the DWIs would be complicated by variable signal intensity in white matter tracts, depending on their orientation relative to the direction of the diffusion gradient, which could also be affected by changes in the orientation of the patient's head. Although this anisotropy can be exploited in DTI, to be discussed in detail below, it is not desirable for routine clinical DWI. To avoid this problem, one can compute parameters with the property of rotational invariance from the original DWI data because these measures mathematically eliminate any directional dependence that might confuse clinical interpretation. 7), where ADC1, ADC2, and ADC3 are the ADCs along the directions of the 3 diffusion-sensitizing gradients and, in the final expression, ADC = (ADC1 + ADC2 + ADC3)/3. This last variable, ADC, is the average of the ADCi values along the 3 orthogonal directions and is also rotationally invariant. It is variously known as the mean diffusivity, the trace ADC, Dav, or, simply, the ADC. Henceforth in this discussion, as is typical in the clinical setting when the acronym ADC is used, it will refer to this averaged value. Isotropic DWI and trace ADC maps can be constructed from more than 3 diffusion-encoding directions. However, it is preferable that the diffusion-encoding directions not be collinear (ie, pointing in opposite directions along the same axis) and that they be as widely distributed in 3D space as possible. This latter condition is satisfied by mutual orthogonality in the case of 3 diffusion-encoding directions. Diffusion along 1 direction cannot be distinguished from diffusion in the polar opposite direction by Stejskal-Tanner diffusion encoding, a property known as “antipodal symmetry”. Therefore, 2 collinear diffusion-sensitizing gradients do not contribute independent information; hence, collinearity should be avoided in DWI acquisitions. The most intuitive way to conceptualize the information provided by the diffusion tensor is to view it geometrically (Fig 4). The tensor effectively fits the angular variation of the ADC values to the shape of a 3D ellipsoid. The diffusion ellipsoid is a shape defined by 6 variables that describes the ADC of water molecules in each direction at a particular time. For isotropic diffusion, the diffusion ellipsoid is a sphere, because the ADC in every direction is equal. Anisotropic diffusion is modeled with an elongated ellipsoid, indicating a greater mean diffusion distance along the longest axis of the ellipsoid. The elements of the tensor above the diagonal are always equal to those below the diagonal (Fig 4, bottom row), a characteristic termed “conjugate symmetry”, which reflects the antipodal symmetry of Brownian motion. Thus, there are only 6 independent elements of the tensor, necessitating a minimum of 6 noncollinear diffusion-encoding measurements to solve for the tensor elements. The diagonal terms of the tensor indicate the magnitude of diffusivity in each of 3 orthogonal directions. In the case of anisotropic diffusion, the off-diagonal terms of the diffusion tensor indicate the magnitude of diffusion along 1 direction arising from a concentration gradient in an orthogonal direction. 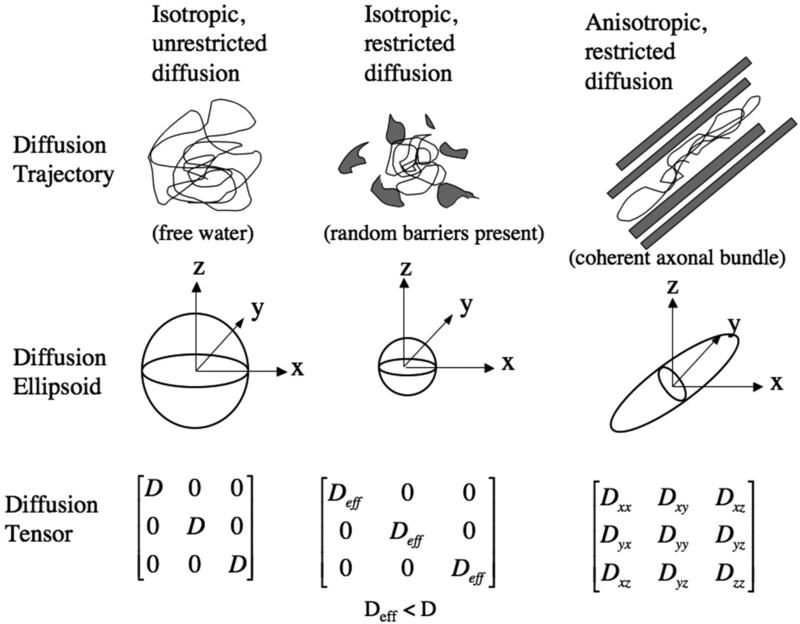 The diffusion ellipsoids and tensors for isotropic unrestricted diffusion, isotropic restricted diffusion, and anisotropic restricted diffusion are shown. The diffusion tensor is rotated by matrix R to produce the diagonal matrix, Λ. The columns of R are composed of the eigenvectors of the system, and RT is the matrix transpose of R. The 3 eigenvectors and rotationally invariant eigenvalues λ1, λ2, λ3 describe the directions and lengths of the 3 diffusion ellipsoid axes, respectively, in descending order of magnitude (Fig 5, top row). The largest eigenvector, termed the “primary eigenvector,” and its associated eigenvalue λ1 indicate, respectively, the direction and magnitude of greatest water diffusion. The primary eigenvector is important for fiber tractography algorithms because this vector indicates the orientation of axonal fiber bundles. Therefore, λ1 is also termed “longitudinal diffusivity,” because it specifies the rate of diffusion along the orientation of the fibers. The second and third eigenvectors are orthogonal to the primary eigenvector, and their associated eigenvalues λ2 and λ3 give the magnitude of diffusion in the plane transverse to axonal bundles. Hence, the mean of λ2 and λ3 is also known as “radial diffusivity”. Top row: The first, second, and third eigenvalues are shown with the same intensity scaling. Note that the eigenvalues are always ordered in descending order of intensity with the first eigenvalue being the greatest. Bottom left: The directionally averaged diffusivity is the mean of the 3 eigenvalues. Bottom middle: The FA indicates the coherence of white matter bundles. 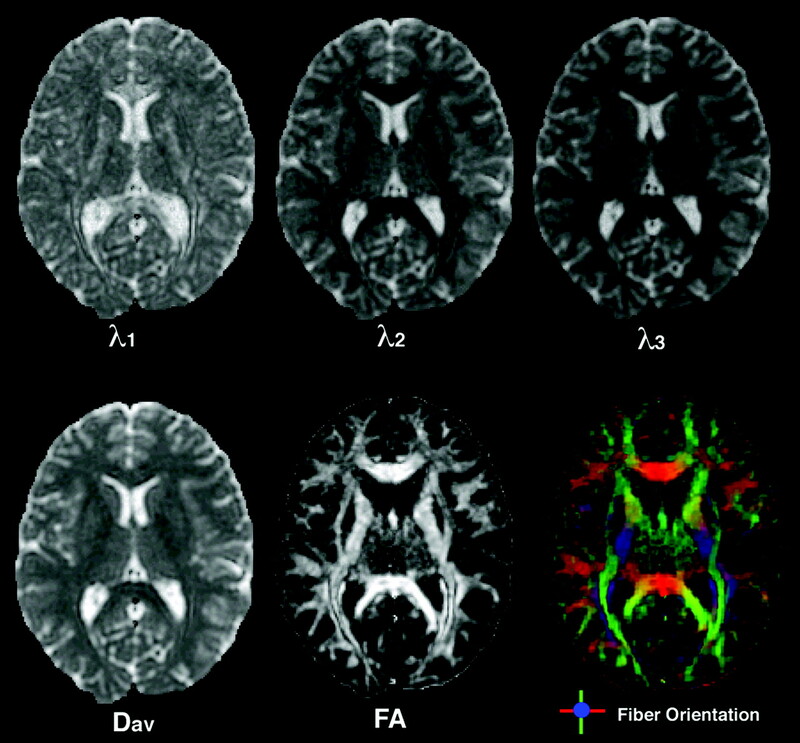 Bottom right: The FA map can be colorized to show the orientation of the primary eigenvector with left-to-right oriented axonal fibers green, anterior-to-posterior fibers red, and inferior-to-superior fibers blue. Colors are additively mixed to represent fiber populations oriented between these 3 cardinal axes. When the primary eigenvalue is much larger than the second and third eigenvalues, anisotropy measures such as FA and RA will be high, indicating a preferred direction of diffusion. This corresponds to a prolate (cigar) shape of the diffusion ellipsoid (Fig 4, right column), with the preferred direction of diffusion indicated by the long axis of the ellipsoid or, equivalently, by the primary eigenvector of the tensor. In the brain, prolate diffusion within a voxel usually indicates a single coherently organized white matter fiber bundle, with the axonal orientation coincident with the primary eigenvector. FA has become by far the most widely used measure of anisotropy in the DTI literature, and its value varies from zero, in the case of isotropic diffusion, up to a maximum of 1, indicating perfectly linear diffusion occurring only along the primary eigenvector. The fiber orientation information inherent in the primary eigenvector can be visualized on 2D images by assigning a color to each of 3 mutually orthogonal axes,84 typically red to left-right, green to anteroposterior, and blue to up-down (Fig 5, bottom right). Schematic demonstrating the FACT algorithm. Arrows represent primary eigenvectors in each voxel. Red lines are FACT trajectories. Multiple regions of interest are used with the FACT algorithm to delineate the corticospinal tract. 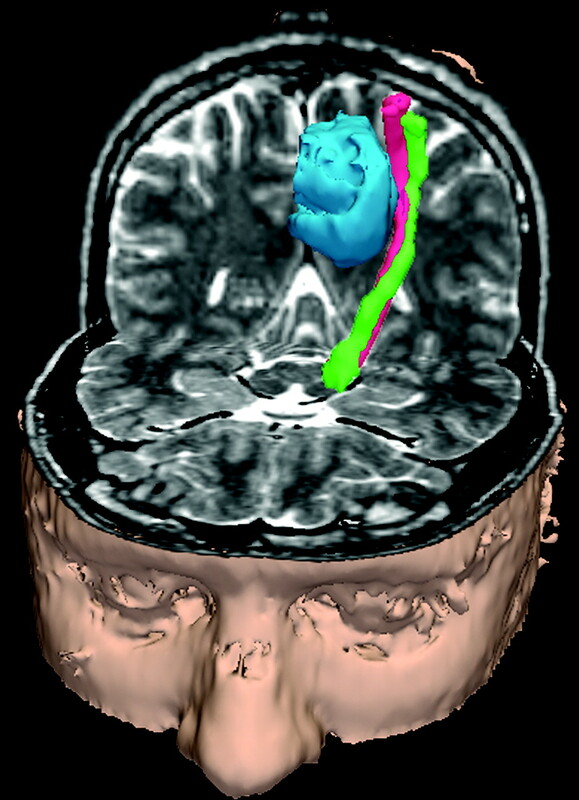 Left: Fiber tracks (red) are generated from a region drawn in the cerebral peduncle (yellow voxels). Middle: Streamlines also passing through a region drawn in the posterior limb of the internal capsule (green voxels) are retained. Right: The final set of streamlines most closely corresponding to the corticospinal tract passes through the centrum semiovale (blue) in addition to the internal capsule and cerebral peduncle regions. 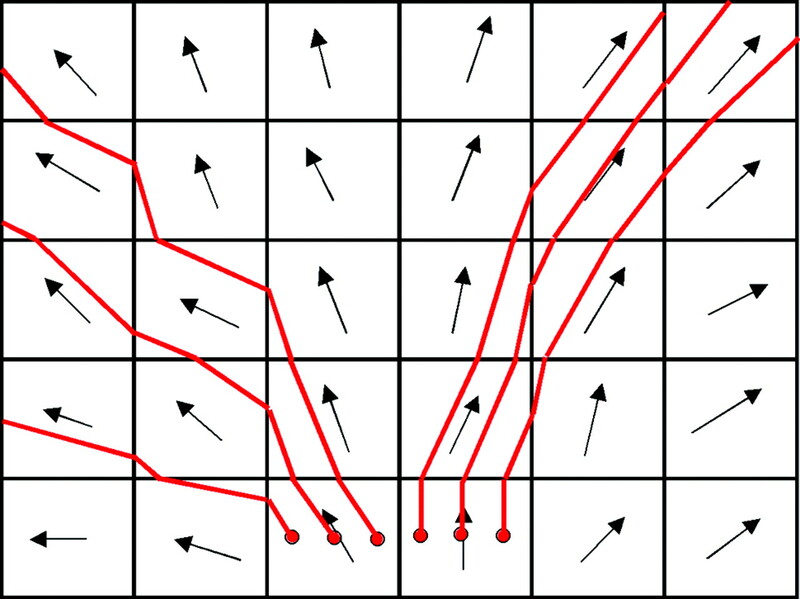 Noise, patient movement, and distortion from imaging artifacts produce uncertainty in the orientation of the diffusion ellipsoid and are detrimental to deterministic streamline fiber tracking.98, 99 Probabilistic fiber tracking methods incorporate the expected uncertainty into the tracking algorithm and can be used to produce a connectivity metric for each voxel. The probability density function of the orientation of a neuronal fiber can be estimated with an empiric function based on the FA,86 a Bayesian model,100 or bootstrap statistics.101 Probabilistic DTI fiber tracking techniques tend to disperse trajectories more than deterministic methods and have the potential to delineate a greater portion of a white matter tract. However, the accuracy of these probabilistic methods is still limited by the information contained in the diffusion tensor and the method of constructing the probability density function. Another fundamental limitation of diffusion tractography is that it cannot distinguish antegrade from retrograde along a fiber pathway, due to the antipodal symmetry inherent to the diffusion process. DTI fiber tracks reveal the course of the corticospinal tract along the border of a brain tumor (blue). Streamlines were launched from wrist (green) and shoulder (red) motor stimulation sites on the cortex. The wrist and shoulder motor streamlines twist about each other as they descend from the cortex through the internal capsule to the cerebral peduncle. DTI fiber tracks of the optic radiation in a 35-week gestational age premature infant. Streamlines were generated with the FACT algorithm and are colored according to the underlying FA in the voxels that the streamlines pass through. The proximal segment of the optic radiations, near the lateral geniculate nucleus, has the highest anisotropy. This review article has explored the theoretic background needed to understand clinical DWI and DTI, including fiber tractography, and their application to neuroradiology. These diffusion MR imaging techniques provide microstructural information about biologic tissues that is not available from other imaging techniques. In the central nervous system, this has yielded important new tools for diagnosis in ischemia, infection, tumors, and demyelinating disease, among other pathologies, as well as for presurgical mapping of white matter pathways to avoid postoperative injury. However, even as sophisticated a mathematic construct as the diffusion tensor is an oversimplification of the properties of water diffusion in the brain. The limitations of the diffusion tensor in areas of complex white matter architecture, where fiber tracts intersect, branch, or are otherwise partial volume averaged within a voxel, affect the ability of DTI fiber tractography to fully delineate an axonal pathway and may also lead to the generation of spurious tracks.95 Measurements of quantitative DTI parameters such as FA are also difficult or impossible to interpret in regions of complex white matter. These problems have led to the introduction of more advanced methods such as high angular resolution diffusion imaging118–120 and diffusion spectrum imaging,121 which promise to overcome many of the inadequacies of the tensor model. These newer methods take better advantage of ongoing technical developments, including the synergistic combination of ultra-high field diffusion122 with highly accelerated parallel imaging,123–125 and lead to new scientific and clinical applications such as probabilistic tractography126–128 and whole-brain connectivity networks.129 Hence, these newer techniques that transcend the diffusion tensor are likely to be adopted in clinical neuroradiology during the years to come.